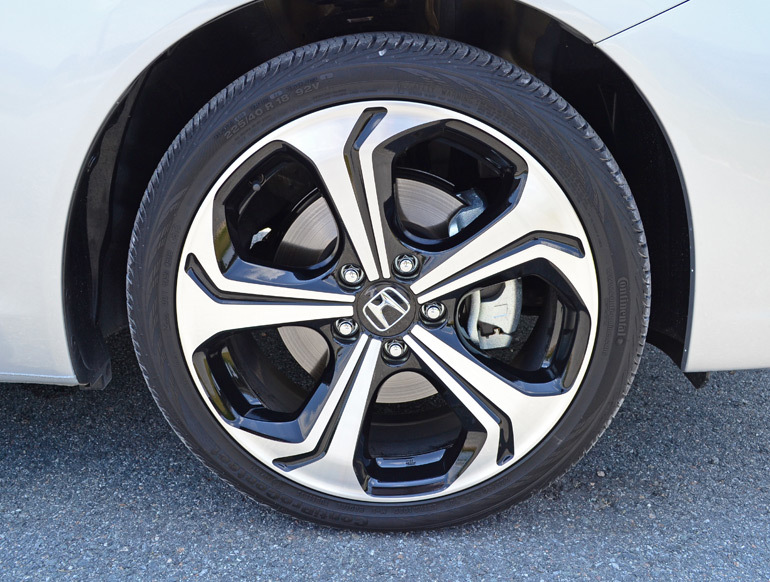 The new 2014 Honda Civic Si Sedan receives a restyled front and rear end for the model year as well as a freshened interior, and suspension tuning exclusive for the Si models. 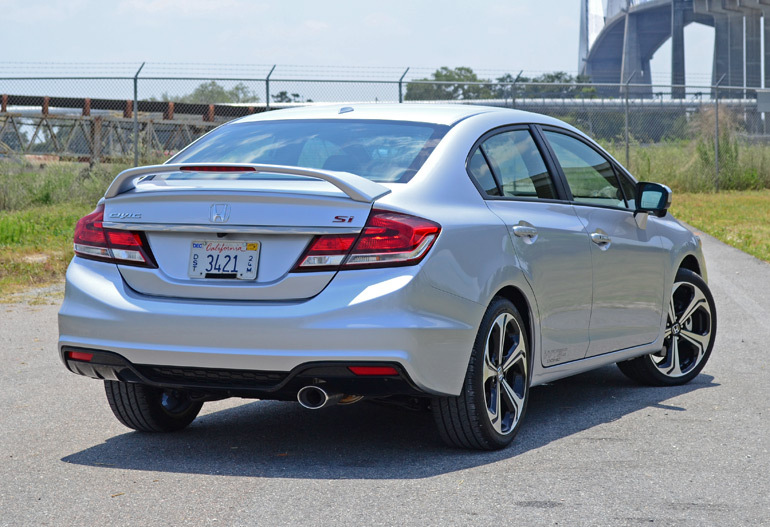 Carrying on the tradition of the Civic Si being the performance trim of the bunch, the Civic remains to offer a wide array of versatility and functional fun in the Si variation, coupe and sedan, yet still remains economical in more ways than one. For 2014 the Honda Civic makes due with traditional trim options while each receive additional power in addition to a few upscale options for the Si and upper-level trims, including keyless ignition, smart entry system, enhanced smartphone integration and a passenger-side blind spot camera accessed by the turn signal or signal stalk button. By adding these changes, the Honda Civic captures a broader spectrum in the compact and sport compact segment. 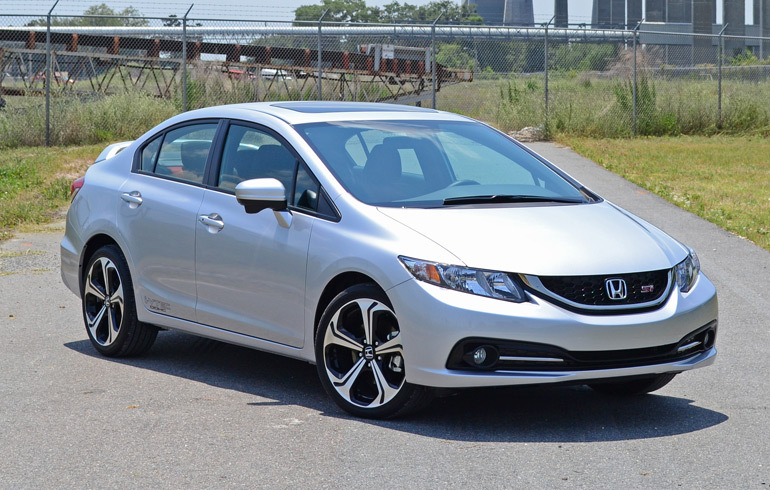 With the Si attempting to offer the best bang for your dollar in terms of performance and amenities, it keeps its top-dog stature to remain desirable for enthusiasts and seekers of a Civic that has a little extra punch. 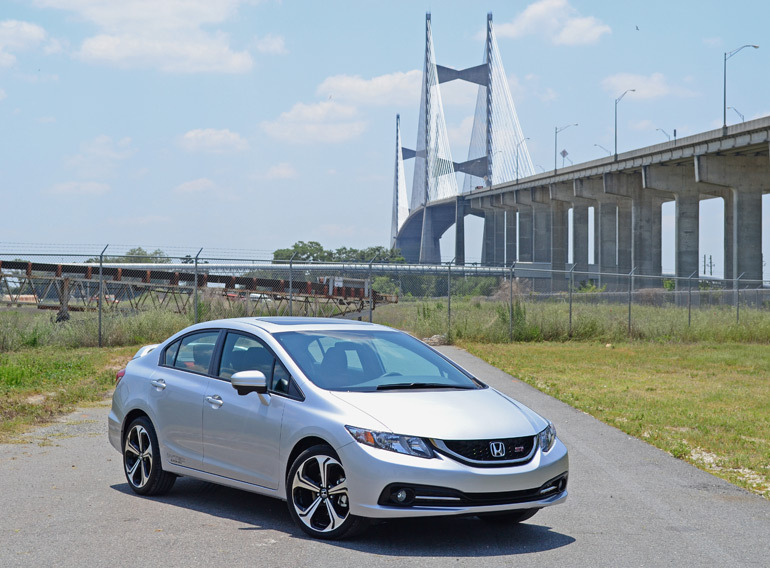 In terms of performance, the new 2014 Honda Civic Si isn’t shy about its agility and confidence in those inspiring to toss its 3,000-pound body around. The front wheel drive Civic Si powered by a 2.4-liter DOHC (dual overhead cam) 4-cylinder engine with Honda’s latest iteration of i-VTEC (intelligent Variable Valve Timing and Lift Electronic Control) varying the cam timing, is a wonder in itself generating 205 horsepower at 7,000 rpm and 174 lb-ft of torque at 4,400 rpm. 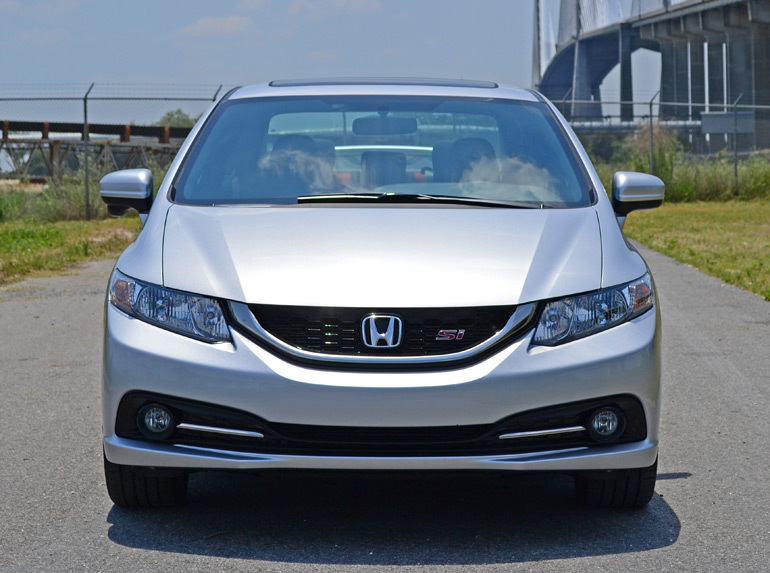 Power is transmitted through the only offered transmission for the Si, the way enthusiasts like it, a 6-speed manual. Driving the 2014 Civic Si literally to the redline and a hair over you can expect to quickly row through the buttery gear gates to reach 60 mph in about 6.1 seconds. 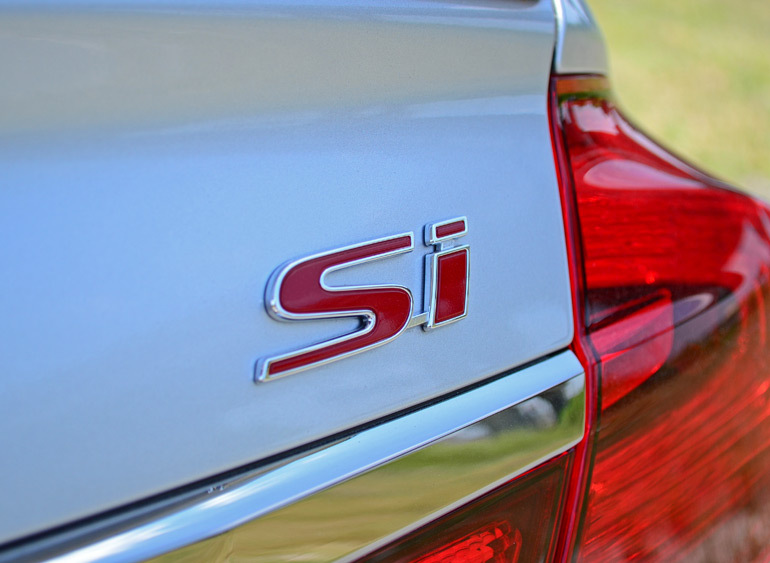 The previous year brought about changes to address the Honda Civic Si’s driving nature, and it is safe to say that it is back on track headed in the right direction. Part of the Honda Civic Si’s eagerness to perform light track duties and make it home from autocross events with a smile on your face is an attribute to its wonderful drivetrain. Being a front wheel drive vehicle that requires some serious revving to extract every bit it has to offer, makes the Civic Si an engaging vehicle. Moreover, the standard Helical limited slip differential up front aides to the Civic Si’s ability to maneuver around sharp turns and bends without thrashing into an understeering oblivion. 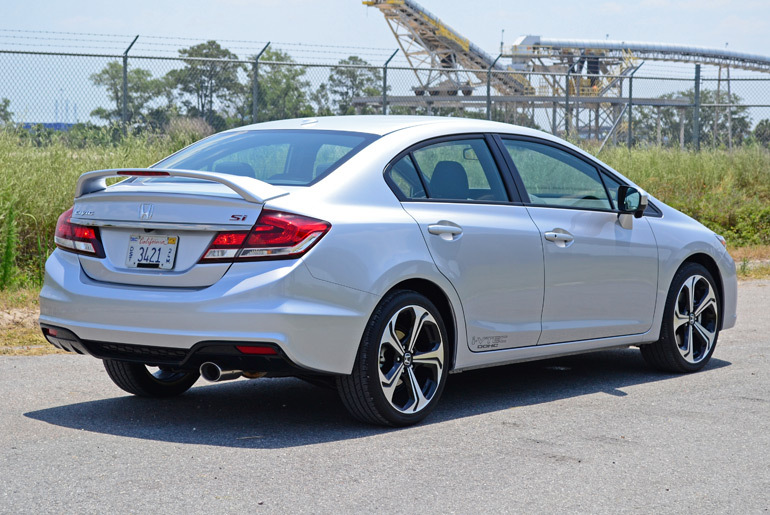 The Civic Si is nicely planted while its retuning and firming of the suspension only adds to its ability to keep you confident on those spirited drives. The 2.4-liter 4-cylinder engine harmonizes its power through the rpm band with improved torque at the low end and a progressive increase of power after 4,500 rpm. It is not until then that you start to really get the power from the i-VTEC engine where there is a nice little surge of power just before 7,000 rpm right to fuel cut, which is buried in the redline. 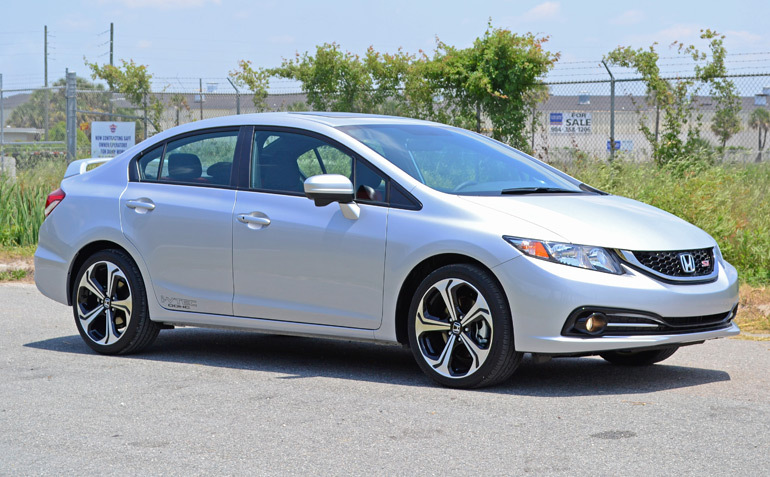 Yes, the 2014 Civic Si begs you to rev it just shy of fuel-cut to really get what you paid for, and to tell you the truth, the Civic Si remains to be an exceptional performance value with an economical conscience. Vehicle balance is an delicate act and stepping out the rear end can be a challenge but the limited-slip makes all of the difference in the world to plant the front wheels in somewhat of a harmonizing sync with where you point the nicely weighted steering wheel. Even then, your foot work on the easy-to-drive characteristic of the soft clutch and nearly butter-box-smooth shifter all play to the tune of enthusiast’s hearts. 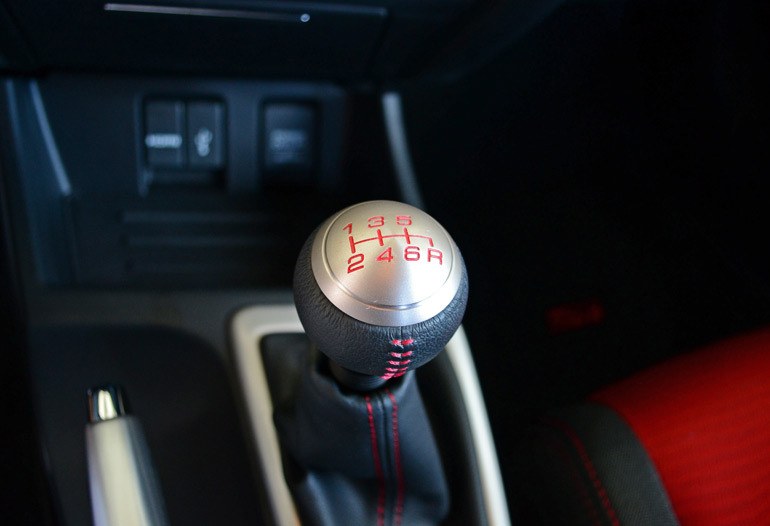 The 6-speed manual is among the best in the business for this class of a vehicle and it shows in how easy it is to land each gear off of 7,000-plus RPM shifts keeping the engine into its most aggressive VTEC cam timing and lift for optimal power output. 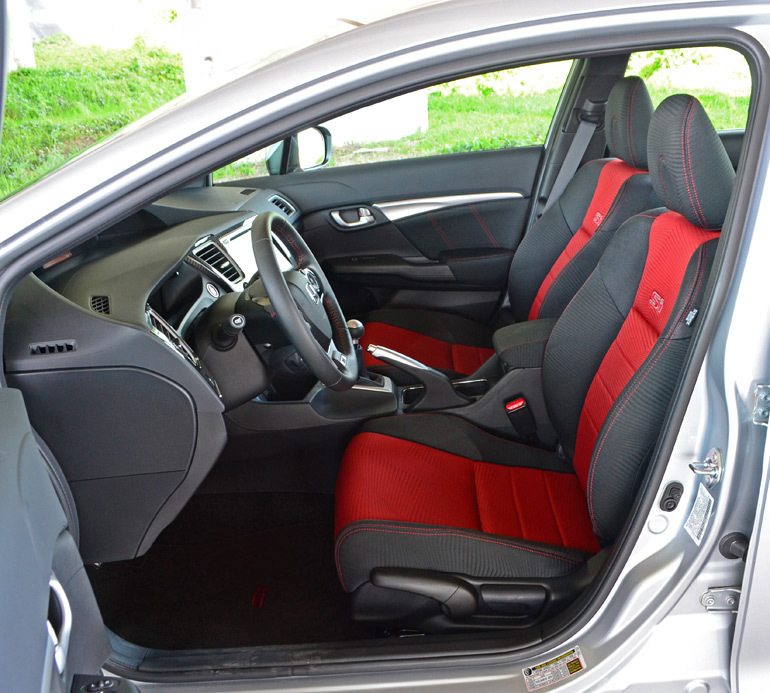 Inside of the 2014 Civic Si Sedan you will find a re-worked cabin that complies with the Civic Si’s enthusiastic roots. 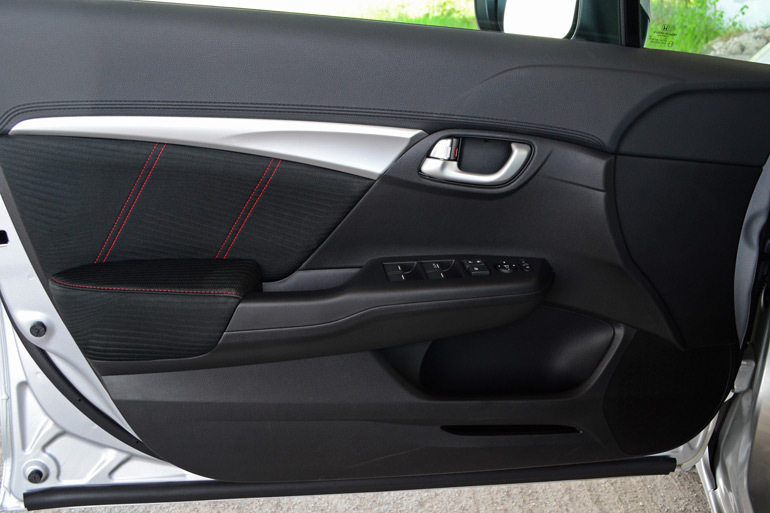 The use of padding over hard plastics are in the ideal places where the accented red stitching throughout the nicely bolstered seats and door trim all play well to the aesthetics of a sporty character. 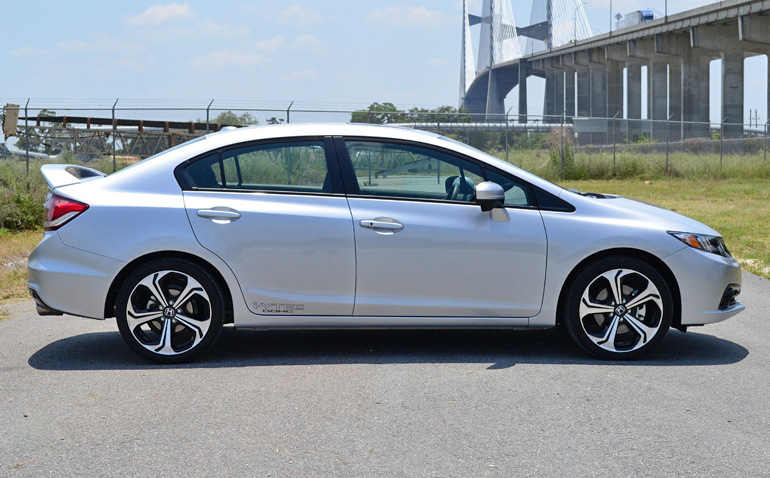 Equipped with the navigation package, my 2014 Civic Si Sedan brings just want you want to the table of a well-equipped sport compact vehicle. 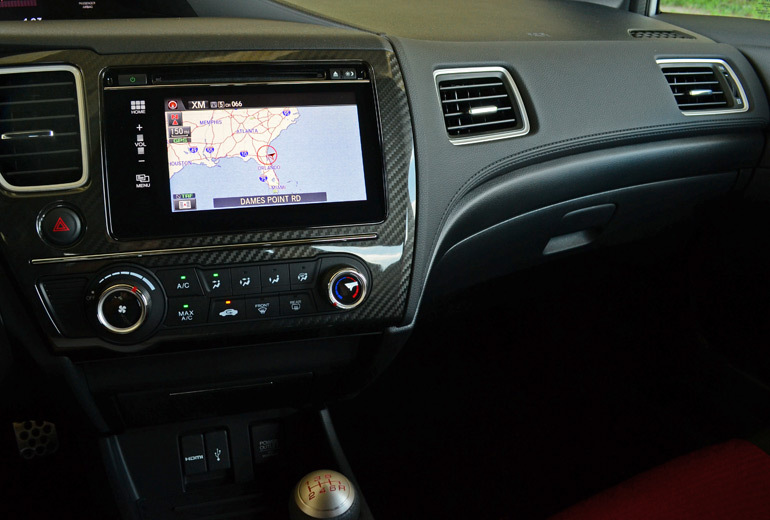 The new navigation system fed through a glossy touchscreen can be a bit cumbersome in navigating through the menu sets and features. Use of the home screen, somewhat of an annoying backwards step, is essential to access separate systems and there are no knobs or physical buttons for the system, with the exception of steering wheel-mounted buttons, power button, eject and the day/night mode toggle. Overall, the system nestles several infotainment functions while the manual climate controls are separated below the screen with large physical buttons and rotary dials. Seating areas are large enough to pile in 4 adults comfortably but things get a bit tight in the back seat with the extra 5th passenger. 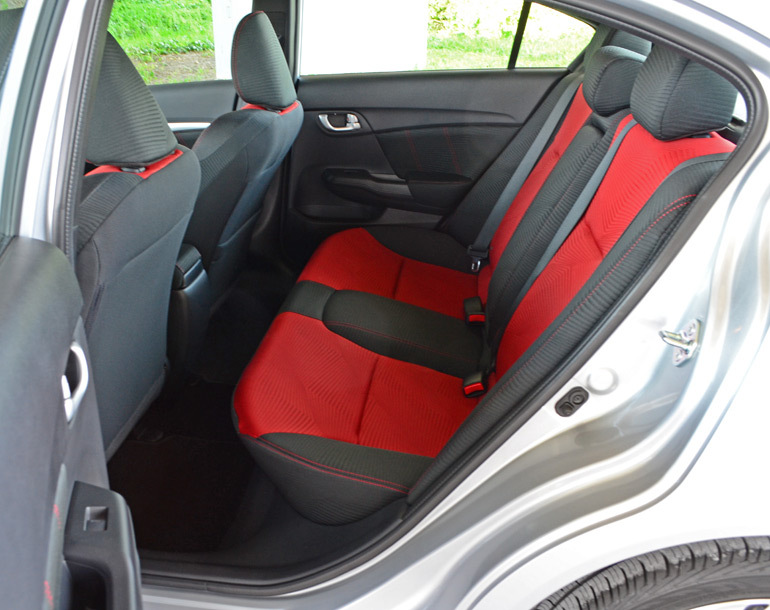 The sporty manual-adjusted cloth seats up front of my test vehicle proved to be supportive enough and very pleasing to the eye to match the sporty nature of the Civic Si Sedan. Driving position is ideal thanks to the manual height adjustment, while the carried-over split dashboard and gauge clusters take a bit to get used to. The large dashboard tachometer viewed through the leather-wrapped steering wheel is a nice central focus as you will need to view it many times when rowing through the gears to get the best performance out of the high-revving engine without bouncing off of the rev-limiter. The digital speedometer and information display are more of an afterthought for your viewing if you are primarily focused on the lower-positioned RPM tech. 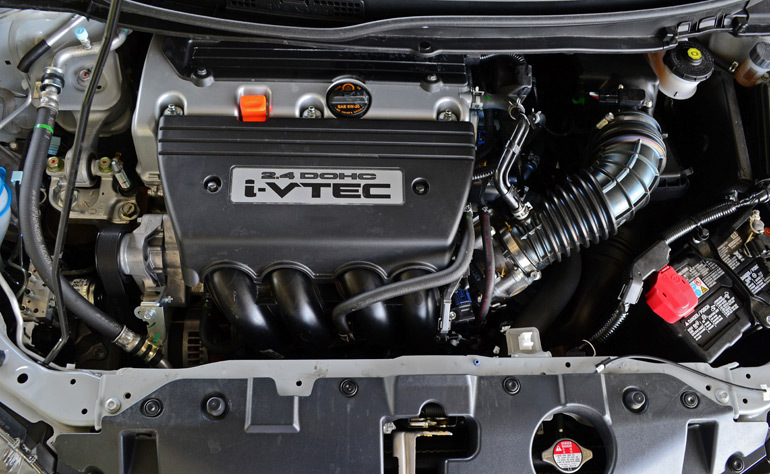 The i-VTEC display, simulating progressive steps of the valve timing during high revs, is more of a novel afterthought when the engine requires wringing it out slightly into redline. Nevertheless, it is fun to look at when you are pushing the engine into its sweet redline spot and doubles as a shift light. Honda’s latest and improved HondaLink nicely integrates features from your smartphone, such as Siri usage on the iPhone via the steering wheel voice button and vehicle speakers/mic, the Aha app, ability to read SMS text messages, and emergency assistance via Assist Automatic Collision Notification – the system automatically connects and verifies your emergency via a Bluetooth-connected smartphone. 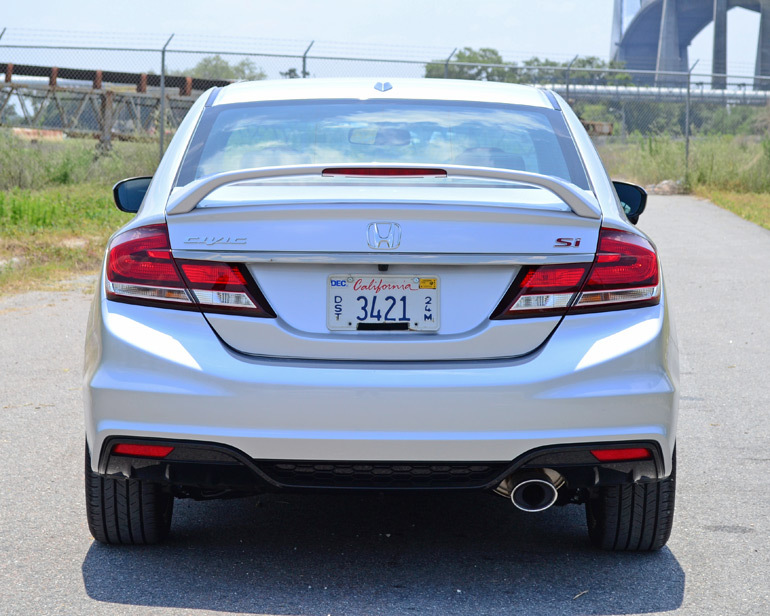 The new 2014 Honda Civic Si Sedan beats to a traditional tune and with the several improvements and upscaled features now made available, the beats come to the forefront a little clearer. The new Honda Civic Si Sedan proves its value and economical side with an EPA estimated 22 mpg city and 31 mpg highway and its pricing starting at $22,990. 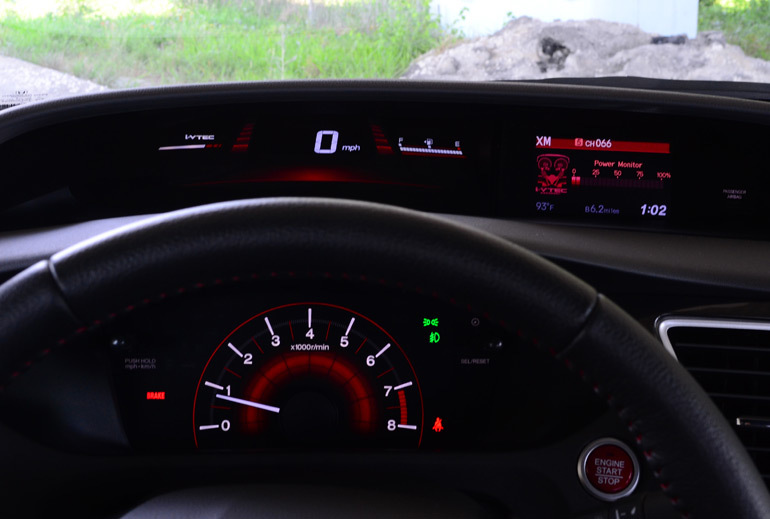 My 2014 Honda Civic Si Sedan with the navigation trim option came to an as-tested price of just $25,230 including a $790 destination and handling charge.